Dundee and Angus offers visitors on spa breaks in the area a wide array of places to visit. It’s outstanding natural beauty provides majestic glens, breathtaking coastline plus cosmopolitan city. On your spa break in Angus why not take the time to take a stroll along one of the areas pristine beaches or discover the fascinating history at historic attractions ranging from world-class museums to grand historic buildings and legendary ships. You’ll also find charming country towns such as Brechin with it’s magnificent cathedral and quaint fishing villages, sample delicious food and drink in fine restaurants, cafés and bars and get up close to local wildlife. Our spa breaks in Angus are available at the Carnoustie Golf Hotel & Spa. 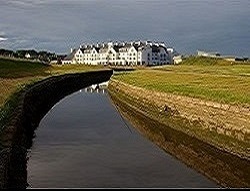 With extensive spa and health facilities the Carnoustie Golf Hotel is the ideal place for a spa break in Scotland. With 75 luxury ensuite bedrooms and ten suites with amazing views over the Championship course, the sea and the local town of Carnoustie, it is perfect for when you need an escape. As well as the hotels professional spa therapists you will find you are spoilt for choice with the facilities on offer which include, large heated swimming pool, sauna, whirlpool, steam room and for the more energetic a fully equipped gymnasium. The Dalhousie Restaurant has been awarded an AA Rosette for fine dining and offers a wide selection of locally sourced, freshly prepared dishes. Why not have an after dinner drink in the relaxing surroundings of Calder’s Bar to finish of your evening? For more information or help choosing your perfect spa break packge, please call us on for free on 0800 012 2000.